You can make Cards, ATC's, Gifts, Layouts, whatever you can think of - you are only limited by your imagination. Looking forward to some exciting creations. Friends, originally uploaded by moonpie creations. 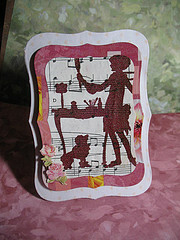 Anniversary Wishes, originally uploaded by stampstudio1(Susan). 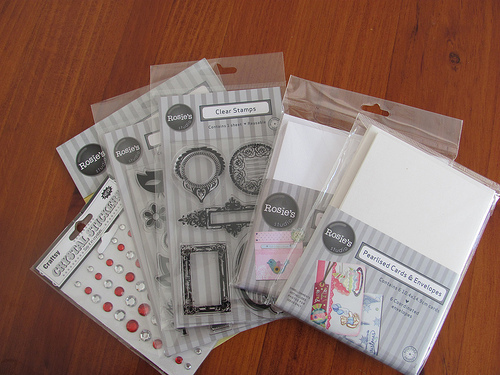 Hero Arts love , originally uploaded by sally_sherfield. This is a fun technique to try. I found the instructions in this You Tube video. 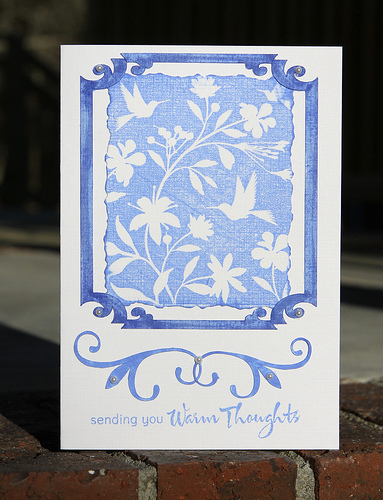 You can choose any of your nestibility shapes and embossing folders for this. Here is another one I did. Go have a look at the Video and have a go.... it is fun. I've been looking at all the creations in our Flickr group and there are some real beauties.... Go and check it out here. I'm back again with my second embossed card to share. As you can see it's very simular to the first card here. 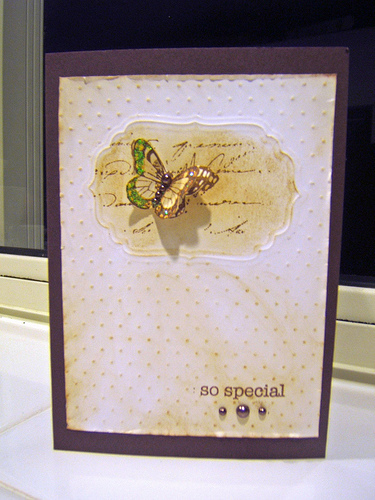 This time I have used Allegro & Script embossing folders by Cuttlebug (Provo Craft). I used this Greeting Farm stamp as well. 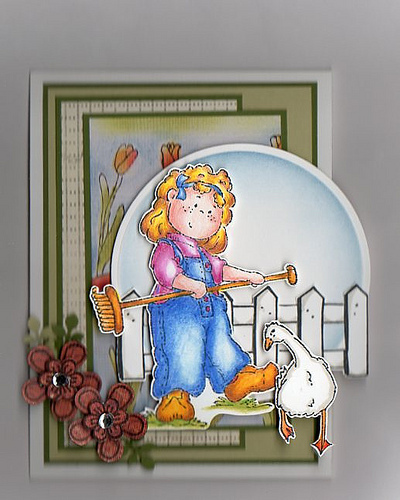 I coloured her with my Copics & used Tumbled Glass distress ink on the the raised sections of the embossed papers. For the Circle I used my circle Nestibilities & offset a smaller circle inside to get the cut out I desired. I also used a small cirlce nestibility for the sentiment. For a Sweet Friend, originally uploaded by GuppyStorm. Wild Flowers and Butterflies, originally uploaded by heather maria. Just thought I'd drop in to show you what the prize for this month's challenge is. The very lovely Arlene is our host for this month & she has kindly dontated the following prize(s). Wow thank you so much Arlene :D. So if you want to play along & maybe win a prize please go here. I thought I would share two cards over the next couple of days, showing why embossing folders are good to have ;). On this card I made plain cardstock into "pattern paper" using my embossing folders, distress ink & stickles. The two folders I used are D'vine Swirl & Distressed Stripes. I wanted the Mermaid to look like she is underwater. I used the D'vine Swirl folder on plain c/s. 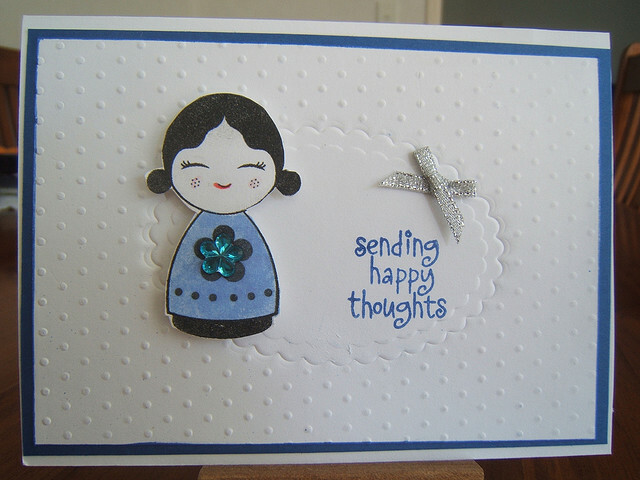 Then after running it through my cuttlebug, I used some Diamond Stickles on the raised swirls. I also used Tumbled Glass on the raised section of c/s I embossed with Distressed Stripes. The fish are a cuttlebug die (I don't remember the name sorry). 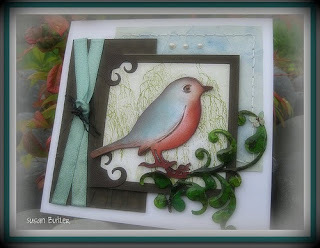 I hope this has inspired you to get out your embossing folders & have a play :D. They are so much fun & so easy to used. Happy Crafting every one. Friendship! I value my friends and love to get together for a lunch or a morning bagel or such. 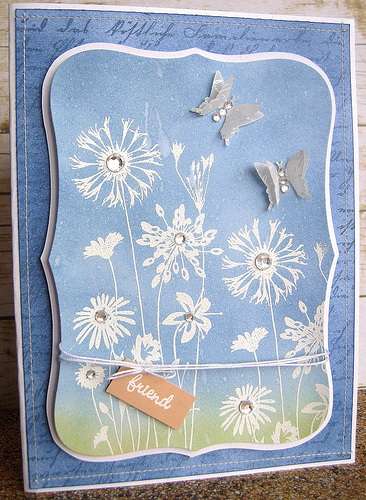 Most of us have friends we only contact in emails, but let's send a card to a friend just to say hi. Or you could make a Valentine card for your dearest friend. It's all about friendship. 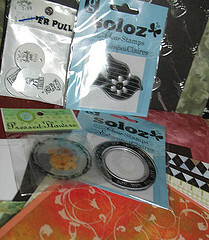 I haven't gotten my goodies together in one place, but will post the photo of the prize package soon. The winner will be drawn at the end of February. I do hope you stop in & join us, it's a lot of fun. Happy Crafting everyone.